This price is only available to U.S. customers. International customers order here. The higher price covers our shipping costs. Written by Dr. Daniel Kamen, D.C., author of The Well Adjusted Horse, The Well Adjusted Dog, and The Well Adjusted Cat. This workbook contains extensive step-by-step explanations of how to perform dozens of horse and dog chiropractic techniques and evaluations. It also includes lots of information on various musculo-skeltal conditions for both horse and dog. Case history forms, pictures, and case studies. 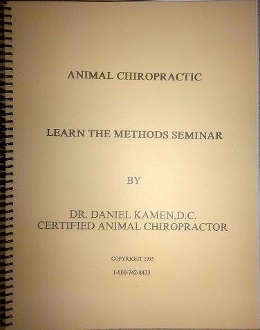 This is the same workbook registrants receive at Dr. Kamen's hands-on animal chiropractic workshops. Over 200 pages.